“My Worm” 24 x 24 Giclee stretched canvas prints are available. I am an Advocate and a teacher. An advocate for art and turtles, and a teacher of both. Some find that an odd combination, but somehow they have combined to formulate my direction. You see, after being lost, Turtles brought Art back into my life, and have shown me that they needed an advocate. After raising a family and a long hiatus from painting, I was in need of a artistic outlet. 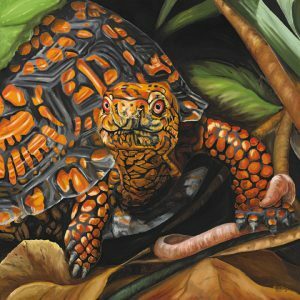 I found myself in front of my easel painting portraits of Box turtles. I had been studying them and their demise here in central Virginia and learned that they needed an advocate. The eastern box turtle is among the most colorful turtles in the world and one of Virginia’s oldest residents. Although once common and easily found, the box turtle has suffered population reductions caused by numerous factors. Habitat destruction and roadways have contributed to the loss of many, and now poaching and disease are threatening remaining isolated populations. Years ago, I studied Art, and the lofty title of “artist” always made me feel like an underachiever. I have found that as an Art Advocate, I can share my knowledge and I can share the inner peace that creating art gives me. My background as a School Art Teacher, An After School art director, and a Paint and Sip Instructor has allowed me to design a mobile program that inspires participants to create artwork that is purposeful as well as unique. With my seldom seen view of a Box turtles world, I hope to impart the viewer with wonder and an appreciation of these amazing dinosaurs of our modern age. All of my Turtle art is done in Oils, and signed numbered canvas copies are available of most. I have expanded my mediums and subject matter, and enjoy painting pets and animals that have a story to tell and I enjoy sharing art with children from 6 -106 ..!